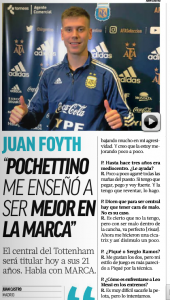 Juan Foyth joined Tottenham at the end of the summer 2017 transfer window, after a transfer pursuit which had gone on for some months. 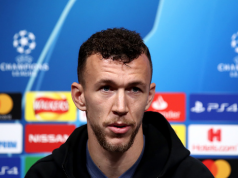 The French media had insisted repeatedly that PSG were the favourites to sign the player. Yet, the media close to Estudiantes repeatedly insisted Foyth himself rather fancied a move to Spurs, wanting to play under Mauricio Pochettino. He got his way, and in his first season the defender was very much learning behind the scenes, not to be seen on the pitch. This campaign he has eleven starts across all competitions and is an increasingly used member of Pochettino’s Spurs squad. He’s also getting more Argentina recognition and is currently away with the national squad. With Foyth expected to start this evening against Venezuela, Marca got a few words with the player. The Spanish newspaper then put it to Foyth that some people believe defenders need a ‘bad face’, and point out that he hasn’t, being quite innocent looking. Technique and aggression appear to the key things for Foyth’s future.